We were robbed. By this point in time, we were supposed to have giant wheel-shaped space stations, huge lunar bases in crater Clavius, and expeditions to Saturn. Instead we have a few footprints on the moon, a few kilos of lunar rock, an aging smallish space station nearing the end of its operational life, and no space shuttles. And there has not been a man on the moon since 1972. If only things had turned out a little differently. Which leads us to the ever-popular "Alternate History" branch of science fiction. Here SF authors make small but significant changes to the flow of history, and predict the results. Some are not quite as nice places to live, some are better, but all are very different from the history we are currently living in. 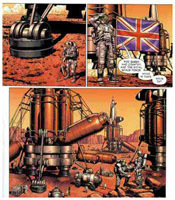 As far as spacecraft based alternate history goes, most alter some point a few decades back. Exceptions include James White's THE SILENT STARS GO BY, where Hero of Alexandria's aeolipile survives the sack of Rome, resulting in the first starship being launched in 1492. William Proxmire, for all you too young to know, was a US Senator intent on furthering his political career by exposing what he considered wasteful government spending (see "Golden Fleece Awards"). Proxmire earned the unending enmity of space advocates and science fiction fandom for his opposition to space colonization, ultimately eliminating spending on said research from NASA's budget. In response to a segment about space colonies run by the CBS program 60 Minutes, Proxmire stated that; "it's the best argument yet for chopping NASA's funding to the bone .... I say not a penny for this nutty fantasy". Arthur C. Clarke and Larry Niven retaliated by respectively writing the award winning stories Death and the Senator and The Return of William Proxmire. In a number of circles his name has become a verb, meaning to unfairly obstruct scientific research for political gain. 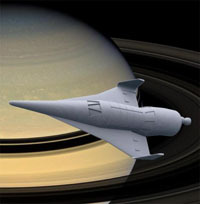 In his Hugo Award nominated short story "The Return of William Proxmire", Larry Niven writes of Proxmire funding the development of a time machine. 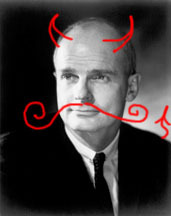 Proxmire's evil plan is a desperate attempt to destroy the literary genre of "science fiction" altogether. Proxmire notes that his efforts to abolish space travel are opposed by people who grew up reading science fiction in general, and the works of Robert Heinlein in particular. In our time line, Heinlein was in the US Navy but was discharged in 1934 due to pulmonary tuberculosis. Proxmire travels back in time and inject Heinlein with antibiotics, ensuring that Heinlein will stay in the Navy and not become an author. Proxmire returns to the present, snickering that he has destroyed science fiction and space travel. Boy, is he disappointed! When he returns, Dr. Andrew Minsky tells Proxmire the bad news. "You were right, the whole science fiction magazine business just faded out in the fifties, last remnants of the pulp era. Campbell alone couldn't save it. Then in the sixties the literary crowd rediscovered the idea. There must have been an empty ecological niche and the litcrits moved in. "Speculative fiction, spec-fic, the literature of the possible. The New Yorker ran spec-fic short stories and critical reviews of novels. They thought Planet of the Apes was wonderful, and Selig's Complaint, which was Robert Silverberg's study of a telepath. Tom Wolfe started appearing in Esquire with his bizarre alien cultures. I can't remember an issue of the Saturday Evening Post that didn't have some spec-fic in it. Anderson, Vance, MacDonald ... John D. MacDonald turns out novels set on a ring the size of Earth's orbit. "The new writers were good enough that some of the early ones couldn't keep up, but a few did it by talking to hard science teachers. Benford and Forward did it in reverse. Jim Benford's a plasma physicist but he writes like he swallowed a college English teacher. Robert Forward wrote a novel called Neutron Star, but he built the Forward Mass Detector, too." "There's a lot of spec-fic fans in the military. When Apollo Twenty-one burned up during reentry, they raised so much hell that Congress took the crewed space program away from NASA and gave it to the Navy." William Proxmire glared and Andrew Minsky grinned. "Now, you left office in the sixties because of the cheese boycott. When you tried to chop the funding for the Shuttle, the spec-fic community took offense. They stopped eating Wisconsin cheese. The San Francisco Locus called you the Cheese Man. Most of your supporters must have eaten nothing but their own cheese for about eight months, and then Goldwater chopped the milk price supports. 'Golden Fleece,' he called it. So you were Out, and now there's no time machine." "We could build one," Proxmire said. Rescue Apollo Thirteen? The possibility had to be considered. Andrew remembered the twenty years that followed the Apollo flights. In one set of memories, lost goals, pointlessness and depression, political faddishness leading nowhere. In the other, half a dozen space stations, government and military and civilian; Moonbase and Moonbase Polar; Life photographs of the Mars Project half-finished on the lunar plain, sitting on a hemispherical Orion-style shield made from lunar aluminum and fused lunar dust. I do not commit murder under any circumstances. "I don't think so, Bill. We don't have the political support. We don't have the incentive. Where would a Nobel Prize come from? We can't prove there was ever a timeline different from this one. Besides, this isn't just a more interesting world, it's safer too. Admiral Heinlein doesn't let the Soviets build spacecraft." Proxmire stopped breathing for an instant. Then, "I suppose he wouldn't." "Nope. He's taking six of their people on the Mars expedition, though. They paid their share of the cost in fusion bombs for propulsion." This story is a rebuke of William Proxmire that is a bit more savage. And rightly so. Arthur C. Clarke's was a big fan of J. B. S. Haldane, calling Haldane "the finest intellect it has ever been my privilege to know." Clarke was quite bitter about Haldane's tragically short life due to cancer. Haldane once commented on how his life might have been prolonged by living in the microgravity environment of a space station. Clarke said this is one reason why he becomes incandescent with rage when some utter moron says money spend on aeronautic research is a waste, the money would be better spent here on Terra on something like medical research. Which explains Clarke's reaction to William Proxmire in general, and Proxmire's targeting NASA in particular. "Death and the Senator" features senator Martin Steelman, a thinly disguised stand-in for Proxmire. Steelman in his "relentless pursuit of power" had no time for such things as "the whole universe of art and culture", not to mention such incidentals as his friends and family, where "love had been sacrificed on the alter of ambition". He had been on the Senate Committee on Astronautics and had built his reputation being a guardian of the public purse, a "hardheaded man who could not be bamboozled by Utopian scientific dreamers" of NASA. It was not that he had any particular feeling for space and science, but he knew a live issue when he saw one. 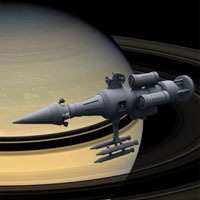 Among other things, Steelman killed a NASA project for a fifty-man space station, with a medical research lab. Then, years later, this comes back to haunt him. Steelman, in a routine medical check-up, is diagnosed with terminal heart disease. He has only six months to live. As Steelman is winding up his affairs and writing his last will and testament, one of his political opponents shows him some interesting news. 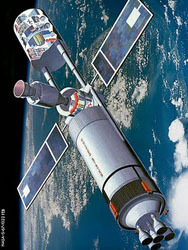 The USSR had created a huge space station years ago; Mechnikov Station, the Satellite Hospital. They have discovered the microgravity environment of the station can arrest the progress of Steelman's heart disease, maybe even cure it. The Russians are only too happy to consider Steelman to be admitted to the Satellite Hospital. What a propaganda coup! However, Steelman has a rude awakening. Before departing, he discovers the huge waiting list of patients who need to go to the Satellite Hospital. Many of whom are quite young. Steelman jumping to the head of the line means one of them will die. It is quite a pity the Satellite Hospital has such limited patient space. If only NASA had built their own space station, there would be room for more patients. But alas, NASA's station had been axed by some senator named Steelman. In the story Steelman at least has the decency to do the right thing: giving up his slot in the Satellite Hospital and going back home to die in six months. The man who goes by the name Grimjier of Hobby FuZion is working on a tabletop game played with little plastic spaceships called "Legend of Sol: Torch War". This is set in an alternate history where the North American Space Command and the Supreme Soviet Cosmo forces battle in space in the far flung future year 1960. 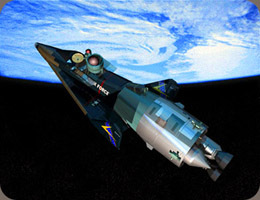 The early American ships are based on the Boeing X-20 DynaSoar and Project Gemini. The battleships are nuclear pulse Orion drive. The plastic miniatures can be purchased from his Shapeways on-line store. I recommend that you order them in the "Transparent Detail" material, the "White Strong & Flexible" has a grainy look. Once you paint the transparent detail it will be a nice crisp (opaque) model. The actual game is still under development. You can follow recent developments by monitoring the "Hobby Fuzion Minatures" thread on the Starship Combat News forum. Late news: alas, the game development appears to have stopped. However the miniatures are still available for sale. Man Conquers Space is an awesome movie project set in an alternate history where the Collier's Magazine "Man Will Conquer Space Soon!" predictions actually came to pass. It has it all, the giant winged ferry rocket, the wheel shaped space ship, the lunar expedition of tank ships; they are all there. Just like a Chestley Bonestell painting. Do check out the stills from the film and the movie clips. My personal favorite clip is the Teaser I (2001), it always brings tears to my eyes. We could have had this. Late news: alas, the site has vanished, which probaby means the project is dead. Looks like it vanished around March 2015. I set the links to point to the archive on the Wayback Machine. 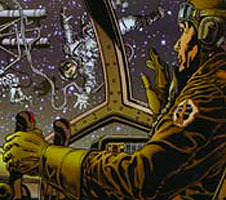 Deep Cold has images from an alternate history where the Cold War between the US and the Soviet Union extended into space. All the rendered images are based on historical fact. 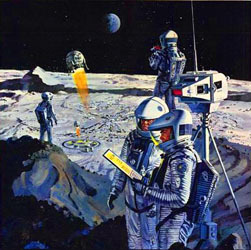 All the spacecraft shown were planned but never flew operationally (some cancelled before they left the drawing board). They represent a fascinating look at what might have been. Late news: alas, the site has vanished, which probaby means the project is dead. Looks like it vanished around December 2014. I set the links to point to the archive on the Wayback Machine. Rob Davidoff has a degree in Mechanical Engineering with a concentration in Aerospace. In other words, he is a rocket scientist. Ian Mitchell is a physics Ph.D. student at the University of Houston studying experimental particle physics. Together they are currently working on a fascinating alternate history of the NASA space flight program called Eyes Turned Skyward. It diverges from our history at the point where the Apollo program comes to an end, and in our time line NASA decides to go with developing a space station, instead of the Space Shuttle. The consequences of not having a reusable launch vehicle in the 1970's are interesting, to say the least. 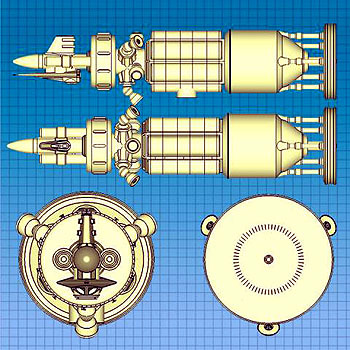 There is a Wiki with Eyes Turned Skyward Spacecraft and Launch Vehicle Data and Artwork. There is a forum thread about making Eyes Turned Skyward mods for the game Kerbal Space Program. I assisted the team with some space related data. 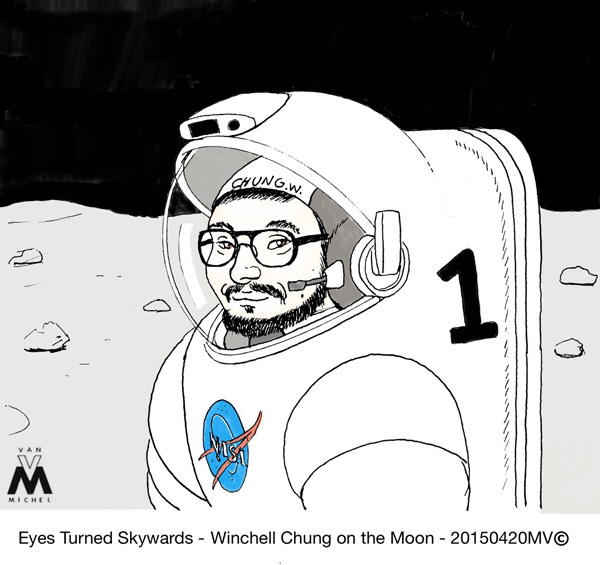 In exchange Michel Van immortalized me on the moon and I was Tuckerized. David Portree is the manager of the Regional Planetary Information Facility, Astrogeology Science Center, US Geological Survey. 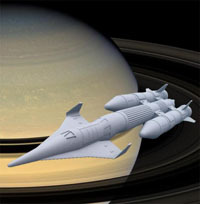 His blog DSFP's Spaceflight History Blog is full of great articles on the history of spaceflight. But recently he has been applying his encyclopedic knowledge to crafting an alternate history that he calls "Imagining Another Apollo". Last I checked it was up to part 5, it is interesting reading. 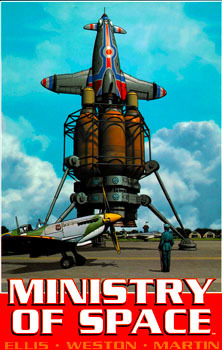 The Ministry of Space is a graphic novel written by the legendary Warren Ellis and illustrated by Chris Weston, published in 2001. It is an interesting alternate history where at the end of World War II the British instead of the Americans got their hands on Germany's rocket scientists. This results in a new British empire in Space. But it is all very scientifically accurate, abet very Collier's flavored. 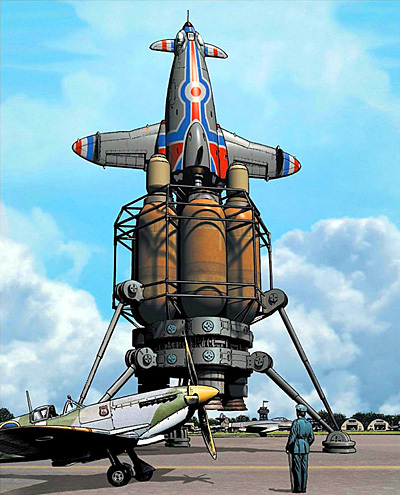 Chris Weston's amazing British-Colliers-von Braun rockets are a real treat for the eye. Warren Ellis story is believable, plausible, but mordant and containing cutting social commentary. And there are some who wonder if Britain can create a real Ministry of Space. Voyage by Stephen Baxter is an alternate history novel where president John F. Kennedy was wounded but not killed in the assasination attempt in 1963. It traces the history of a vastly expanded space program, though it does include a disasterous piloted test flight of a NERVA spacecraft that puts a stop to nuclear power in space. "Boo, hiss" says the author of the Atomic Rocket website. But the rest of the novel is fascinating reading. 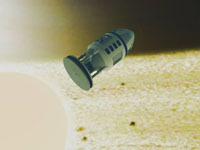 Titan by Stephen Baxter is an alternate history novel where a strong tide of anti-intellectualism in the United States (led by a fundamentalist president who mandates that school science classes should give equal teaching to the theory that the Sun orbits around the Earth) threatens the existence of NASA. NASA is forcibly merged with the US military, so its budget can be diverted into increasing defense spending. After the permanent shutdown of the space program, a small team of NASA scientists hatch a desperate plan to rekindle pubic interest in crewed space exploration and combat the loss of the pioneering spirit in modern US politics and culture. They create a crewed expedition to the moon Titan by recycling older spacecraft into new uses. Their mission is sabotaged at all levels, but it takes new urgency when a Chinese military stunt involving an Earth impacting asteroid goes terribly wrong.